MILLINGTON, Tenn. -- The real excitement behind the Summit SuperSeries program is that anyone, anywhere can win it. Drivers from the United States, Canada and even as far away as Aruba, Alaska and Hawaii have the opportunity to race for a track championship and, with a little luck and a lot of skill, make it all the way from their local track to the big stage at the IHRA Summit Racing Equipment World Finals at Memphis International Raceway to compete for a world championship. And that is exactly the tale told by Tim Lucas, Kevin Pollard and Justin Poindexter. All three drivers won at their local tracks, advanced further at the Team Finals level and eventually found themselves walking in Memphis along with 48 other drivers going after a championship. With drivers from all across North America on hand to compete in Memphis, at the end of the day, those three drivers were left standing as the 2013 class of the IHRA Summit SuperSeries presented by AMSOIL as Lucas (Lillington, N.C.) took the title in Top ET, Pollard (Fincastle, Va.) claimed the Mod ET championship and Poindexter (Millington, Tenn.) won the Junior Dragster world championship. "I told everyone that it would be a dream come true to come here and win this thing and to actually be standing here today, holding this trophy, I am at a loss for words," Lucas said. 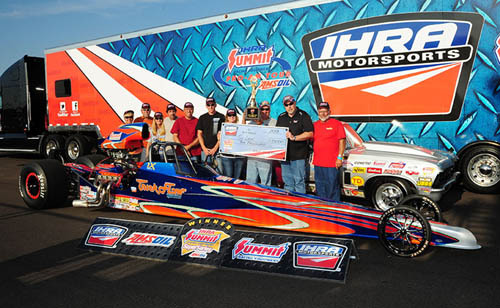 "There are a lot of bracket guys out there that would probably love to run the circuit, but the IHRA and Summit give those guys an awesome place to race. Summit has made a dream come true for a guy like me and I just want to thank them, IHRA and everyone that is involved with this program. It is unbelievable, it really is." After tearing up his primary car one week ago, Lucas traveled to Memphis in a car familiar to most that follow the IHRA circuit - Donald Webb's gorgeous Camaro. In that borrowed ride, Lucas went four huge rounds on Sunday culminating with a victory over another longtime bracket racer, Irving, Texas' Don Boulware. In a final with decades of experience between the two, it was actually Boulware who had the advantage on the tree with a perfect .000 reaction time to Lucas' .016, but Lucas battled back on the top end with a 10.132 on a 10.12 dial at 128.27 miles per hour while Boulware, in a very quick dragster, ran a 7.442 on a 7.41 dial at 175.82 mph in the runner-up effort. Lucas also had wins over Chris Butcher, Eric Boyd and Brad Perkins to reach the finals. "I was a lot more calm than I thought I would be going into the final," Lucas said. "I knew there was a lot on the line, but I tried to put that behind me and just focus on running my race which really helped me turn on that win light." Representing Fayetteville Motorsports Park, Lucas reached the Summit SuperSeries championships via a win at the Division 9 Summit Team Finals, while Boulware used a runner-up finish in Division 4 representing Dallas Raceway to reach the big show. With the win Lucas claims a $10,000 prize courtesy of Summit Racing Equipment, a brand new dragster built by Maddox Race Cars with a Trick Flow engine, a custom paint job by Imagine That Custom Paint and major components from Moser Engineering, Abruzzi Transmissions and Converters and many more, a championship trophy, diamond ring, a trip to Aruba and more. In Mod ET Kevin Pollard survived a grueling day of competition against some of the best racers from across North America, culminating with a matchup with South Carolina native Jay Norris in the final. With more than $10,000 and the title of world champion on the line, Norris let up a tad too early to light the red bulb by -.029 allowing Pollard to take a leisurely Sunday drive and the Mod ET championship in the process. Pollard also recorded wins over Greg Sauvage, Brad Hall and Andy Closkey to reach the final. "The day didn't start off like we would have liked, I missed the tree in qualifying which made me pretty nervous, but after that things started to calm down and it was pretty smooth sailing from there," Pollard said. "I won two track championships this year, won three Summit SuperSeries championships, won some good money races, so it was a pretty good year, but none of that compares to what I am feeling here this weekend. I am really excited to win this thing." Pollard reached Memphis with a win at the Division 1 Summit Team Finals representing home track Motor Mile Dragway, while runner-up Jay Norris claimed a spot at the Division 2 East Summit Team Finals representing Union County Dragway. The Mod ET winner receives $10,000 from Summit Racing Equipment, a $2,500 gift certificate from Trick Flow Racing, a Gemini two-post Auto Lift and a Howell pit bike. The winner also receives an Aruba vacation, IHRA Gold and Silver Card, World Champion Ironman and more. Finally, in Junior Dragster hometown boy Justin Poindexter from right in MIR's backyard of Millington, Tennessee, took the championship over defending Junior champion Austin Johnson. With the experience of knowing his home track, Poindexter remained clam under pressure and put together a tremendous run, one that would mean very little as Johnson lit the red light by -.021. It was a heartbreaking loss for Johnson, who was going for his second world championship in a row. Poindexter also had wins over Garrett Lloyd, Leroy Thomae and Rachael Whitney to reach the final. "It was a pretty fun year. I have been doing it for six years and I really like it," Poindexter said. "I am very excited about winning this dragster, I want to drive it tonight, but they won't let me. It is so awesome and I want to thank everyone that helped make it and helps us race." 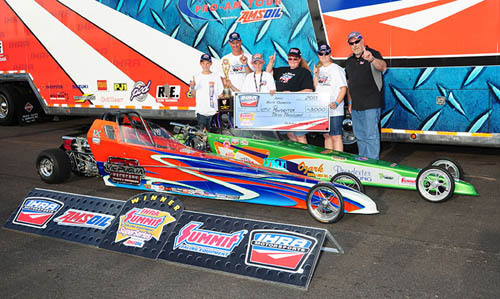 Poindexter reached the big stage after finishing runner-up at the Division 2 West Summit Team Finals representing Memphis International Raceway. Johnson, once again representing Motor Mile Dragway as track champion, won the Division 1 Summit Team Finals. The Junior program rewards its winner with $3,000 from Summit Racing Equipment, a brand new Junior Dragster built by Vic Puglia with a custom paint job by Imagine That Customs, a family vacation package that includes passes to Cedar Point and Kalahari Resort, a family pack of tickets to any Feld Entertainment production, an IHRA Gold and Silver Card, World Champion Ironman and more. The 2013 Summit SuperSeries presented by AMSOIL and Moser Engineering featured drivers from over a dozen states and provinces with drivers hauling from as far away as Alaska, Hawaii and Aruba. 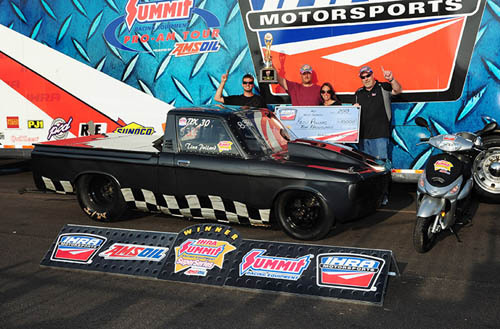 Sunday's final results from the Summit World Finals at Memphis International Raceway. Tim Lucas, Lillington, N.C., '70 Nova, 10.132, 128.27 def. Don Boulware, Irving, Texas, dragster, 7.442, 175.82. Kevin Pollard, Fincastle, Va., '72 LUV, 10.542, 77.75 def. Jay Norris, Campobello, S.C., '78 Aspen, foul. Justin Poindexter, Millington, Tenn., dragster, 8.019, 80.10 def. Austin Johnson, Pearsburg, Va., dragster, foul.